Home / CAPS-News / CHAMPS Fundraising Event, Happening NOW! CHAMPS Fundraising Event, Happening NOW! 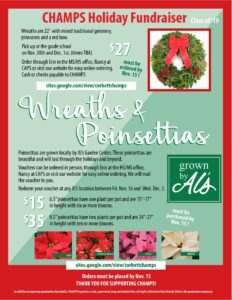 CHAMPS (Corbett High School Association of Mamas and Papas of Seniors) is off and running with Beautiful Wreaths and Poinsettias sales. Click the link below to check out the CHAMPS website, place your order and to make your 2018 charitable donation. CHAMPS next meeting is October 29, 2018 7:00pm – 8:30pm, Corbett School GS Cafe MPB.